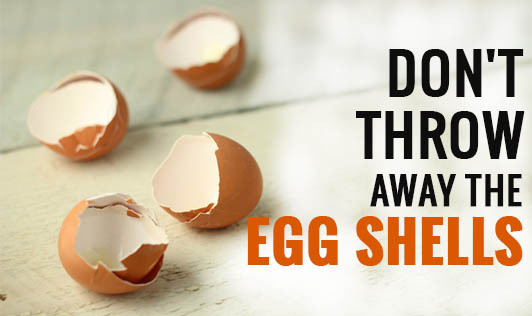 Have you ever wondered before throwing away an egg shell that it could be used productively for other purposes apart from its usual place in the dustbin? Read on to find out different ways to reuse egg shells. Why waste eggshells when you can use them to better your home garden? Egg shells decompose easily and provide calcium and other minerals useful for plant growth. Crush egg shells and scatter the bits around plants and shrubs. They drive away slugs, snails, cutworms, and grubs. Some animals also despise the smell of decomposing egg shells, giving your outdoor garden more protection. Nothing beats a good cup of coffee to kick start your morning. But, if the bitterness of your black coffee is a real mood buster, try adding crushed eggshells to your coffee grounds in the filter. The coffee instantly tastes less bitter. After use, add the mixture to your compost bin. Add crushed egg shells to soapy water and pour it into narrow-mouthed thermoses and vases. Shake the vase well and pour out. The crushed egg shells provide a mild abrasive action that helps to effortlessly get the dirt out. Create cute little pieces for your Easter eggs display. Remove the white and yolk by making a narrow hole on top and blow out the inside. Wash and dry before painting over the hollow shell. For a sparkly effect, add glitter and rhinestones. Create your very own kinder eggs at home by filling hollow egg shells with jell-O or chocolate. Let them harden in the refrigerator for an hour or until they solidify inside. Remove them and peel the egg shells. You will be left with beautiful egg-shaped jell-O and chocolate treats. Word of caution – wash and dry egg shells (check procedure in point 5) thoroughly before filling them in. Throw in a couple of crushed egg shells into a clogged pipe. The egg shells will trap solids and their mildly abrasive nature will scrape off unwanted gunk. The very-thin transparent membrane found inside an eggshell has medical properties. It can be used for protecting cuts and treating ingrown toenails. Use egg shell halves as a mini pot to grow out your seedlings before planting them in pots. Place soil-filled egg shell halves in the carton that they come in and plant the seeds. Once they grow out a bit, transfer them to the garden and crush the egg shell for compost. Tomato is a good option to start with. Add an egg shell to a small mason jar filled with apple cider vinegar. Egg shells soften in vinegar and gradually dissolve in it. This makes for a calcium-rich mixture that can be applied to the skin while experiencing irritation and itching. 11. Your DIY face mask. Crush egg shells using a mortar and pestle and combine it with separated egg white. Apply the mask on the face and allow it dry off. The combined action of crushed shells and albumin provide a skin-tightening effect. Roast and crush egg shells. Add the fine powder to a cup of milk and let your child have it for at least a month. Egg shells are known to stop bedwetting. Do remember to follow proper hygiene practices before roasting the egg shells. Place egg shells near windows and doors on a higher elevation and drive lizards and spiders away.